Martin O’Malley, former governor of Maryland, announced his 2016 campaign in Baltimore on May 30, 2015. While largely unknown outside of his state, the Democrat has built a reputation as a technocratic and competent executive with a commitment to liberal policy priorities. O’Malley raised taxes dozens of times in the eight years he served as governor while spending soared from $29 billion to $38.5 billion. Because previously authorized and scheduled spending was expected to be even higher, O’Malley touts himself as a budget cutter. He also staked out an aggressive environmental agenda, signing Maryland up for a regional cap-and-trade program and imposing severe regulations on fracking, farming and coal power. He has made reforming Wall Street and breaking up big banks a major focus of his campaign. O’Malley does have a reputation for capable management, and as mayor of Baltimore he relied heavily on the data-driven style of policing that was first popularized (and successful) in New York City. O’Malley’s presidential ambition was given two prized speaking slots at the 2008 and 2012 Democratic national conventions, neither of which seem to have done anything to raise his national profile. Despite being the most explicit about his presidential ambitions leading up to his announcement, O’Malley lags in the early polls. One of the more accomplished Democratic governors around, O’Malley still remains a longshot to capture the Democratic nomination. He has failed to generate much support either through fundraising or in the polls. As a liberal Democrat with a progressive policy agenda he could potentially appeal to the party’s base if the frontrunner were to seriously stumble, similar to John Kerry’s capturing the nomination after Howard Dean’s support collapsed in 2004. But being the “break-in-case-of-emergency” candidate may be O’Malley’s only viable route to the nomination. 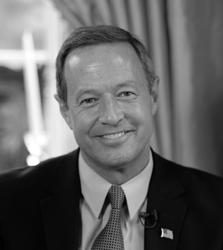 Martin Joseph O’Malley was born in Washington, D.C., on January 18, 1963, the son of Barbara Suelzer O’Malley and Thomas Martin O’Malley. O’Malley, a Roman Catholic, attended Our Lady of Lourdes School in Bethesda and Gonzaga College High School, a Jesuit school for boys in Washington, D.C. He enrolled at the Catholic University of America, graduating with a bachelor’s degree in 1985. Following graduation, O’Malley attended the University of Maryland Law School. He graduated with his Juris Doctor in 1988, and was admitted to the Maryland Bar later that year. His first political experience came as a college student. O’Malley went to Iowa to assist Sen. Gary Hart’s (D-Colo.) presidential campaign in 1984. While in law school, he joined Congresswoman Barbara Mikulski’s successful campaign for U.S. Senate as a field director, and later served as a legislative fellow for Mikulski in 1987 and 1988. He departed Mikulski’s office when he was named assistant state’s attorney for the city of Baltimore, a position he held until 1990. In 1990, O’Malley launched his first campaign for political office, seeking a seat in the Maryland state senate. He would ultimately fall just 44 votes short of knocking off incumbent Republican state Sen. John A. Pica. The following year, O’Malley was elected to the Baltimore City Council, serving until 1999. When incumbent Baltimore Mayor Kurt Schmoke opted not to seek re-election in 1999, O’Malley surprised many by declared his candidacy for the office. O’Malley won the Democratic primary, capturing 53 percent of the vote. He easily won the general election against Republican David Tufaro with 90 percent of the vote. O’Malley declared his candidacy for governor of Maryland in 2005. After his only opponent dropped out of the race, O’Malley ran unopposed for the Democratic nomination. In 2006, O’Malley defeated incumbent Republican Governor Bob Ehrlich 53-46 percent. Ehrlich returned to challenge O’Malley in the 2010 election. O’Malley defeated Ehrlich a second time, 56-42 percent, becoming one of the few major Democratic victories in a year of major losses for Democrats. Term limits prevented O’Malley from seeking a third term as Maryland governor in 2014. O’Malley has been married to Catherine “Katie” Curran since 1990. The couple has four children together: Grace, Tara, William and Jack. O’Malley faced a number of controversies during his tenures as mayor of Baltimore and governor of Maryland. O’Malley has pulled off some surprising political victories, even in heavily-Democratic Maryland. O’Malley was the lone white candidate in the campaign for Baltimore mayor in 1999. It was widely expected that an African-American candidate would win the election in predominately African-American Baltimore.12 O’Malley campaigned hard and won significant endorsements from African-American lawmakers and church leaders.13 O’Malley went on the win the Democratic primary with 53 percent of the vote. In his first campaign for Maryland governor, O’Malley defeated Republican incumbent Bob Ehrlich 53-46 percent. O’Malley served as Chairman of the Democratic Governors Association, suggesting a degree of confidence in his leadership and political skills by his colleagues. During his time as Maryland governor, O’Malley raised taxes and fees and created new taxes and fees numerous times. With only two months remaining in his term, and after Republican Larry Hogan had been elected to succeed O’Malley as governor, O’Malley introduced more than 30 new regulations,22 including regulations on hydraulic fracturing, nutrient runoff from chicken manure, and power plants using coal. In June 2015 O’Malley unveiled an ambitious plan to deal with climate change. He advocated the complete elimination of fossil fuels in the U.S. by 2050, utilizing a cap on carbon dioxide emissions to help achieve this goal.29 While governor, he signed an agreement to make Maryland a member of the Regional Greenhouse Gas Initiative, or RGGI. This agreement resulted in the implementation of a cap-and-trade program in the state. O’Malley’s record on spending and size of government is mixed. He did eliminate 4,200 state jobs. While he touts $9.9 billion in spending cuts during his tenure, the fact is total state spending rose from $29 billion to $38.5 billion under his watch. The “cuts” O’Malley refers to are based on his getting the legislature to alter spending formulas that would have otherwise driven spending up even further. In November 2015 O’Malley released his own health care reform agenda, which would largely enhance Obamacare as it currently is. Key elements of his plan include aggressive anti-trust enforcement regarding hospital and insurer mergers, a ban on what he terms “price gouging profiteering in prescription drugs,” allowing the federal government to set drug prices through Medicare’s buying power, and allowing illegal immigrants to get Medicaid benefits and buy insurance on Obamacare exchanges.45 He has set a goal of getting 95 percent of the public insured,46 above the current level of approximately 88 percent. While governor, O’Malley took several trade mission trips, including visits to Indian and Brazil.51 He opposes the Trans-Pacific Partnership deal negotiated by the Obama administration.52 His campaign unveiled a trade agenda in October 2015 in which he said he would only support free trade agreements “that establish strong and enforceable rules for fair competition,” including requirements that “labor unions, consumer groups, health and environmental advocates” all participate in negotiations,53 which in practice would likely make it very difficult to reach meaningful trade agreements. O’Malley has advocated for the federal government to increase funding for dairy farming by $350 million,59 and also signed a letter supporting reauthorization of the Export-Import Bank, a key corporate welfare entity. O’Malley signed into law the Maryland film tax credit in 2012. O’Malley has a record of making liberal and Democrat appointments to the state’s courts. His appointees to the Maryland courts were overwhelmingly Democrats,85 by a 95 percent to 5 percent ratio. This was a sharp break from his Republican predecessor, whose nominees were 52 percent Republicans and 48 percent Democrats. Two of O’Malley’s appointments to the Maryland Court of Appeals (equivalent to a state supreme court), Sally Adkins86 and Mary Ellen Barbera87 were considered liberals. O’Malley would later back away from his remarks, saying that he “in no way intended to equate these budget cuts, however bad, to a terrorist attack.” He did not, however, apologize for the comments. O’Malley’s reputation for competent executive leadership took twin hits late in his second term, when the implementation of Maryland’s Obamacare exchange was badly botched by his lieutenant governor, who O’Malley had put in charge. O’Malley’s lieutenant governor also was the Democratic nominee for governor to succeed him, but he lost to the Republican candidate in a major election-day upset.